It may be a building site at present but Forum Group’s XXII Carat development, marked by an eight-foot-high gold hoarding, is attempting to lure the world’s super-rich. Positioned next to the One & Only hotel at the extreme end of Palm Jumeirah’s crescent, the 22 seven-bedroom luxury villas are currently being built by the Russian developer Forum Group. It is the company’s first venture into the Middle East. The homes are on the market at between Dh38 million and Dh92m. “There are seven billion people on this planet so I don’t think finding 22 investors who can afford these villas will be a problem,” says Anton Yachmenev, Forum Group’s managing director. So what do you get for your money? 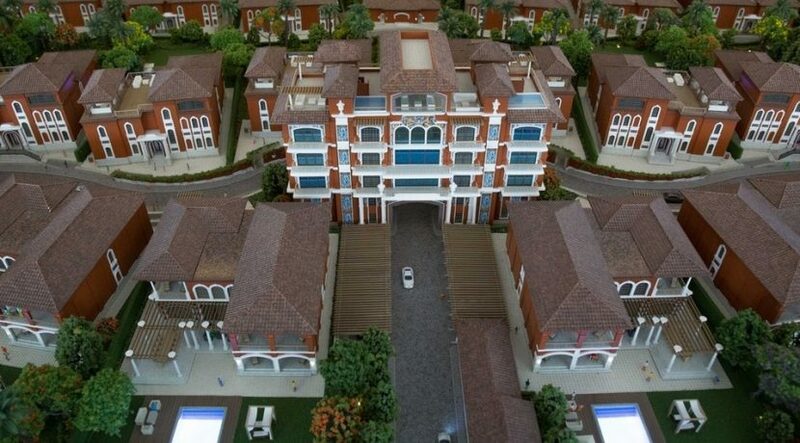 For the biggest spenders, the company says it plans to include a free studio apartment with each of the Dh92m villas as a gift to house staff. In addition, Forum Group is offering some purchasers of its most expensive villas super-luxury interiors, which include the world’s most expensive baths. These bathtubs are crafted from huge slabs of amethyst, rock crystal and malachite and are sourced from the Amazon rainforest before being shipped to Italy to be shaped and polished. They are often sold at prices exceeding US$1m. The company says it is spending Dh30 to Dh40 million alone on the villas’ fixtures and fittings, which will include fingerprint entry, walk-in closets, marble floors, soundproof walls and locker rooms. That’s on top of the Dh200m it spent in 2009 on the land and the Dh200m in basic build costs. “It was a big gamble to buy the land in 2009 but it wasn’t the right time to start this in 2010 or 2011. The market wasn’t ready. Now this place is a lot more developed. There are different kinds of investors coming to Dubai,” Mr Yachmenev says. Forum Group is a developer set up by Russian billionaire Oleg Cherepanov, who made his money by building homes and malls in Russia’s fourth largest city Yekaterinburg. How do the prices compare with other Palm villas? According to property broker Asteco, average prices for villas on the Palm Jumeirah during the final quarter of 2016 stood at Dh2,500 per square foot. 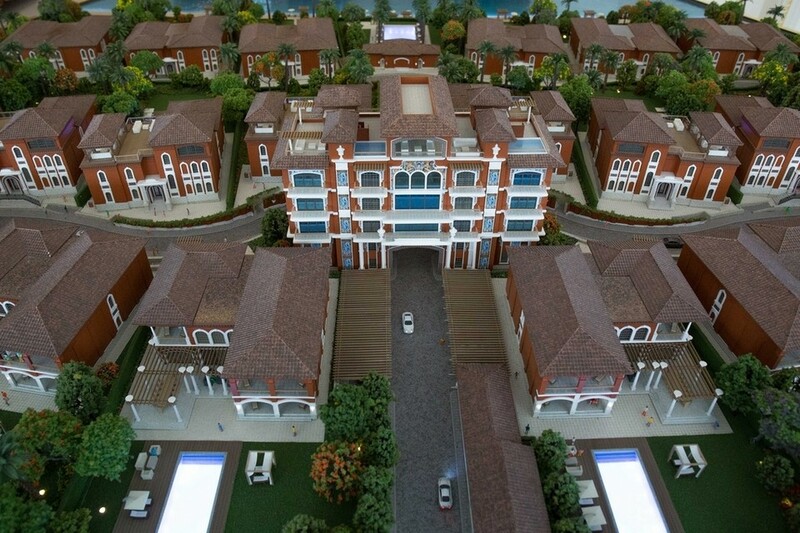 Mr Yachmenev says that the less expensive villas in his development comprise around 10,000 square feet and retail at between Dh4,000 and Dh4,500. However, he says that this compares with refurbished higher number signature villas on the Palm fronds which sell for between Dh3,500 and Dh4,000. The 500,000 square feet plot of land on which the development is being built was purchased for Dh200 million. It was bought in 2009 through equity. How much of it has been built? The developer says it has now completed 40 per cent of construction. So far Forum Group says it has managed to sell five of the villas at the end of last year – albeit at a bit of a discount – to wealthy Russians and Europeans. What else is in the development? Forum Group is also building 10 apartments on the site which are required as part of its planning consent from Palm master developer Nakheel. Forum says it plans to sell the larger units and will give away the studios with every high value villa purchase. Nakheel also requires Forum to build 24-hour dining space which Forum says it is likely to offer to the purchaser of one of the largest apartments as some form of extra private space.